Manchester City may have made striker Kelechi Iheanacho available for transfer this summer, but the 20-year-old will not be leaving on the cheap. West Ham are known to be very keen on snapping up the Nigerian international, while Leicester’s odds on signing him have crashed in recent days, making them the odds-on favourites at the bookies. The Hammers remain seriously interest according to the well-informed Hugh Southton of Claret & Hugh, who reveals that City are asking for a minimum fee of £25 million for Kelechi as they look to offset a planned spend of around £300 million this summer. West Ham have also shown interest in Chelsea’s Michy Batshuayi but at this stage Iheanacho is seen as a more likely arrival, with chiefs from the London club ready to enter serious talks with Man City bosses about signing the player. 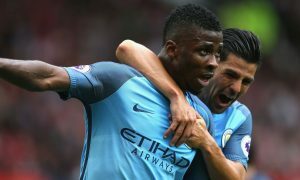 City are in a strong negotiating position with Kelechi having signed a long-term deal until 2021 last year and not particularly wanting to quit the club. With that in mind, the Blues will try to extract the biggest fee possible and it could go beyond £25 million for a player who was imported from the Taye Academy for just £250,000.